Dive with Scuba Cancun, the original dive shop of Cancun. Experienced dive masters will show you some of the Caribbean's hidden underwater treasures. On Wednesdays and Fridays, our Cancun dives go to the famous Underwater Museum. The museum was created by Jason deCaires Taylor in the waters between Cancun and Isla Mujeres in 2010. With over 400 sculptures, the Underwater Museum will act as an artificial reef. 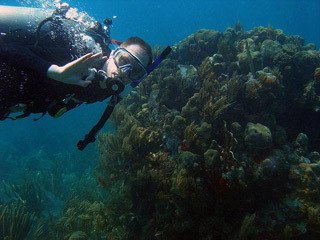 Scuba diving in Cancun and Cozumel allows you to see and experience a whole different underwater world filled with brightly colored schools of fish, coral of all kinds, and many other forms of sea life. Certified divers can choose from any of the dives above. If you want to learn to dive, or just try diving once, book the Resort Course. Want to get certified? Choose the Referral or Open Water Course. Minimum age to dive is 10 years old. Ages 10 to 16 years must have a signed release from parent or guardian. If some of your group wants to dive while others snorkel, we have that option too!